Apple’s laptops are things of beauty — thin, lightweight and fast. Sadly, not a lot of accessory manufacturers seem to take this into account when designing hard drives to work with the MacBook line. Today I’m looking at one notable exception: the G-Technology G-Drive mobile USB-C ($79.95 for 1TB, $99.95 for 2TB, $149.95 for 4TB). The model we tested was the 2TB capacity silver drive. As noted above, the drive also comes in 1TB and 4TB capacities. The 1TB and 2TB drives are the same size (3.23 x 4.33 x 0.41 inches - 110 x 82 x 11mm) and come in Space Gray and Silver, with a gold option for the 2TB model. The 4TB drive comes in the same colors as the 1TB model and is a bit thicker, although G-Technology’s web page for the drive shows the same dimensions as the other models. This slim little drive is definitely made for portability. 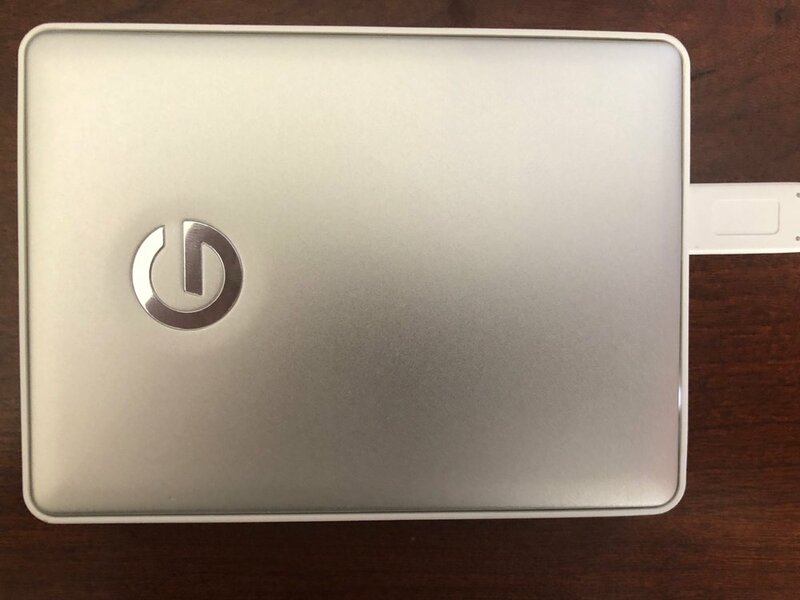 It comes with a USB 3.1 SuperSpeed cable with USB-C connectors, and it uses your MacBook for power. In case you want to connect it with an older Mac or other device, there’s also a USB-C to USB-A cable in the box. The drive uses a 2.5-inch 5400 RPM hard disk drive inside, and has a theoretical maximum transfer rate of 140MB/s. About the only thing you’ll see that shows you that the drive is in use is a tiny white LED. Using the G-Technology G-Drive mobile USB-C is simple. You take it out of the box, unwrap the cable, and plug the drive into the Mac. Since it’s Mac-formatted, the Mac immediately recognizes it as an external hard drive and asks if you wish to use it for Time Machine. It’s very plug-and-play. The usability of a drive depends a lot on the speed, so I used Blackmagicdesign’s free Disk Speed Test to see exactly how fast the drive was in real world read/write speeds and what video formats it would work with. Those speeds are very consistent with the theoretical maximum transfer rate of 140 Megabytes per second. Blackmagicdesign’s tool provides information in sections titled “Will it work?” and “How Fast?” — this assumes that you’re using a disk drive to store video that’s being captured. As you can see from the “Will it work” list below, video can be captured in formats up to 2160p30 with Apple’s ProRes 422 HQ video codec using this drive. For Cinema DNG RAW, 1080p50 is about as good as it gets, while for the “deep” 10-bit YUV 4:2:2 codec, the best this drive will let you capture is 720p50. Frame rates are listed under the “How Fast” section of the Disk Speed Test results. If you’re doing 4K work, you probably want not only a faster drive — probably an SSD version of the G-Drive — but a faster machine as well. For 2K work it’s probably more than sufficient provided you’re using ProRes 422 HQ as your codec. I think the mobile USB-C drive would be best used for backup in the field, and it should excel at that. Being able to move photos or video to your MacBook and immediately grab a backup is a wonderful security process. For Time Machine backups for MacBooks, this drive is not only sufficient in size (especially with the small amount of storage in those machines) but quite speedy. 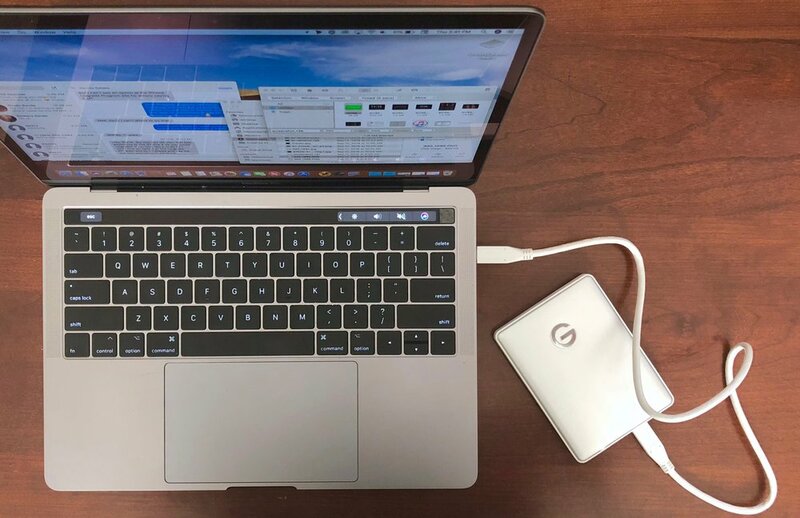 There’s a lot to like about the G-Technology G-Drive mobile USB-C. It’s tiny, lightweight, relatively fast, and even matches the finish of most MacBook models. In addition, the price is right — $99 for a 2TB drive is cheap insurance for any MacBook owner.